They carried the pipe the day after Enda Kenny sat down with them for two hours. The pipe, as it has come to be known, measured 190m and was assembled to give locals an illustration of the size of the proposed wind turbines. Dozens of people put shoulders to the pipe, lugging it from St Michael’s GAA club down through the main drag in Carlanstown. The assembled gathering, running into the high hundreds, came from the village, outlying areas, and three neighbouring villages to observe the funereal procession. Protests over energy projects are now commonplace throughout rural Ireland, but the dispute in north Meath is very different. This time, the whole county is being dragged in. The developer has pledged to help construct a €2.5m centre of excellence for the county’s GAA. Element Power will donate €375,000 towards the construction of the facility, in Dunganny, outside Trim, many miles from the affected communities. The 59 clubs in the county will vote on the offer on August 11, but less than a dozen clubs are located in the broad area of the proposed windfarm. The county board executive has recommended acceptance of the offer. Depending on where you stand, the offer is either astute or cynical. Investment in communities has become a major plank of developers’ strategy for new energy projects. Having the GAA onside in a planning application, in a county where the association is particularly strong, would be a major boost. Apart from the sponsorship offer, Element has pledged to invest €3.5m in the community over the lifetime of the farm. His sentiment is echoed by others who have come together to oppose the project. Personnel from clubs in the vicinity of the proposed farm are working furiously to, as they see it, tell their colleagues elsewhere in the county of the implications for voting to accept. For the county board, the issue is straightforward. It was first approached by the developer a year ago, but only received a concrete offer early in the summer. The matter first came up at the July board meeting, but after some disagreement, it was put back for decision to next month. Energy projects elicit the most primal emotions among those who believe they will be adversely affected. Health is the primary concern, particularly from noise pollution and the concept of shadow flicker, which adversely affects light. Beyond that, many see it as a harbinger of a darker future for their way of life. The area in question is relatively low-lying, with rolling drumlins anchored by the villages of Castletown, Rathkenny, and Carlanstown. Only Lobinstown rises up out of the rich, green pastures, a picturesque cluster of homes of small businesses. Locally, the sponsorship offer is seen as one of three cynical elements in the project. The 47 proposed turbines were part of the Midland Energy Project, involving 1,500 turbines across seven counties, which was designed to export wind power to the UK. In April, the then energy minister, Pat Rabbitte, announced the project was not going ahead. A week later, it began to dawn that Element Power was intent on pushing on with this phase for the domestic market. The NMWIG sees the proposal as an attempt to salvage the larger project that had to be abandoned. Planning for the proposal is to be sought in the coming weeks, under existing guidelines which date from 2006. Following major controversy across the country in recent years, and the threefold increase in the size of turbines in the interim, new guidelines are being prepared. These were due to be ready in September, but this week, it was announced that the deadline had been postponed. Irrespective of that, Element’s project will be processed under the old guidelines, which, locals believe, are entirely out of time. As is now standard in these situations, the group has educated itself on wind energy to a frightening degree. International and domestic reports are presented as evidence of the rightness of their cause. Unlike other groups, NMWIG even managed to snaffle a meeting with the Taoiseach. Ten days ago, Enda Kenny met a delegation in the Kells office of local Fine Gael TD Helen McEntee. The meeting was scheduled to last 20 minutes, but they ended up having his ear for two hours. The following day, they carried the pipe through Carlanstown. From Element’s point of view, it’s just trying to do its business, while being sensitive of local perceptions and disruption. The company has introduced an innovative “near neighbour” fund, in which anybody within 1km of the farm will be entitled to a grant of up to €5,000 for their homes. “We believe the community fund should benefit the specific region and community where the windfarm is located,” the company’s development manager Kevin Hayes says. He confirmed that the sponsorship offer for the centre of excellence was dependant on the project going ahead. Farmers and landowners on whose land the turbines will be sited have already been signed up. Around €20,000 rent per annum per turbine is the going rate. As elsewhere, the rent agreements have opened up fissures in the community. Sources say that relations between the locals who are opposed, and the beneficiaries of lucrative rents, “have cooled”. All within the NMWIG reject totally any standard rumours that there has been intimidation of landowners. The most immediate objective for the NMWIG is to ensure the clubs reject the sponsorship offer. Time constraints have ensured that only one local club has managed to formally delegate rejection, but those involved say all others in the locality will definitely oppose. How the clubs from beyond the immediate area vote will be fascinating to observe. Sponsorship money, in today’s world, is difficult to come by. On the other hand, the ties that have bound the GAA into an unrivalled community organisation have always relied on strength and loyalty at grassroots level. That loyalty would be tested like never before in north Meath if the offer is accepted. If so, it could be that, in time, wounds will heal and the association will continue as before. Or it could be much worse than that. At a gathering of members of NMWIG on Thursday, one local man referenced the dire performance of the county team in last week’s Leinster final against Dublin. “Unlike the Meath team last Sunday, we won’t be lying down,” he says. 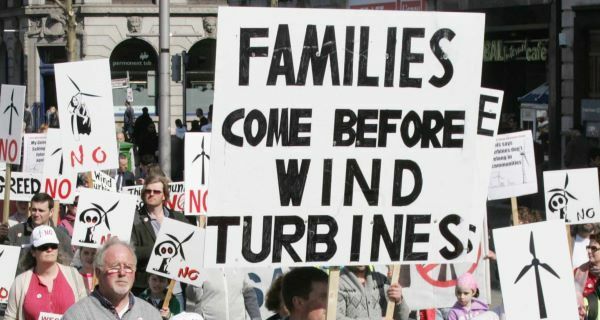 There was anger and confusion yesterday after it emerged that Minister for Environment Alan Kelly may overturn a decision by Donegal County Council to make large tracts of Donegal out-of-bounds for windfarm development. Last month County Councillors voted to vary the County Development Plan in favour of restricting wind farms. They voted by 18-11, with one abstention, to create a set-back distance of 10 times the tip height of proposed turbines from residential properties and other population centres. However, Mr Kelly wrote to the council CEO Seamus Neely on Monday informing him that, in making their decision, the council has “ignored or not taken into account” the advice of his department. As a result, another public consultation will take place in the county before Mr Kelly decides whether or not to formally overturn the council’s decision. His draft direction also relates to two other variations made by councillors last month. The council voted 16-13 to accept the inclusion of Fresh Water Pearl Mussel areas at Clady, Eske, Glaskeelin, Leannan, Owencarrow, and Owenea as areas not favoured for wind farm developments. On the third vote, councillors decided by 21-9 that turbines could only be erected in areas that their ‘zone of visual influence’ did not include Glenveagh National Park. Speaking yesterday, a spokesman for the Glenties Wind farm Information Group described the minister’s decision to consider overturning the councillor’s variation as “incredible” and without legal basis. He said last month’s variation was a “triumph for democracy” and a vindication of the 3,326 people who made submissions in support of them. “The draft Ministerial Order against the variation is an incredible decision by the minister,” said the spokesman. “He did not challenge the executive when they made the current development plan in 2012 and declared 2,300 townlands were ‘preferable’ for windfarm development. The spokesman also rubbished Mr Kelly’s assertion that the variation was “not evidence- based” and did not give proper regard to the 2006 guidelines. A spokesman for the minister said yesterday he could not elaborate on the draft issued to the council as a statutory process must now begin. A spokesperson for the council said they are currently examining the minister’s notification.